This morning I received a tip from one of the top West African fraud experts in the world, Derek Smythe from AA419. Derek and his team had been in communication with several victims of a "Poker Lottery" scam and had documented a set of linked domains. Doesn't that sound a bit suspicious? Sure, if that's all there was ... but wait, there is more! 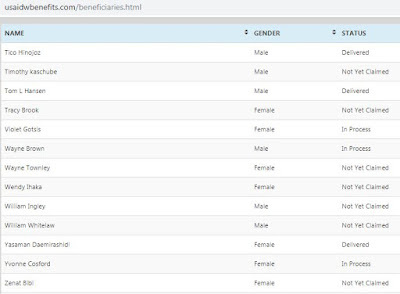 Each website has a list of the 100 "beneficiaries" who have been chosen to receive a prize! Delivered - you've already been suckered. Not Yet Claimed - you've received the Facebook Message, but have not "verified" yourself. Processing - you've provided your personal information, but they don't have your money yet. The "AGENT/OFFICER IN CHARGE" link takes you to a Facebook Page, which will be the source of the message that you received via Facebook Messenger. For many, this acts as a Verification. They get a message, they follow the link, they see their own name, and when they click "AGENT/OFFICER" it takes them to the Facebook page of the person who sent them the message, completing the loop, and solidifying the concept that this is a "real thing." 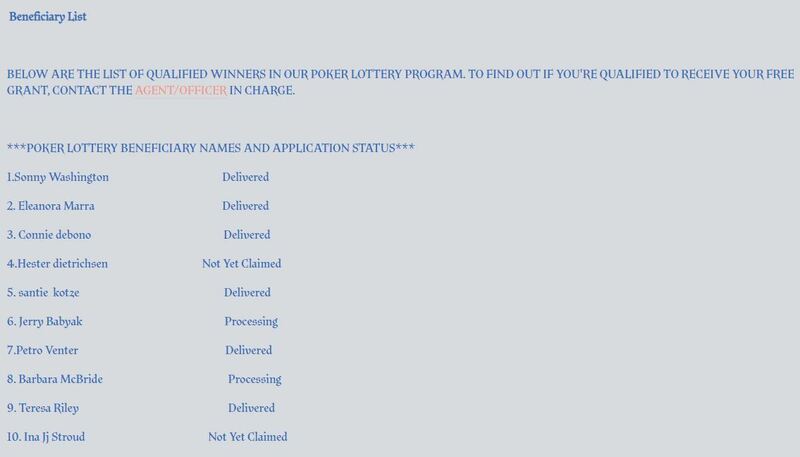 It is also possible that the "Delivered" statuses are just decoys, because who would actually fall for these scams, right? Actually - according to AA419 and their law enforcement friends, these guys have already stolen money from dozens of victims! There were actually several versions of the Verification Form, with some asking for an SSN while others did not. 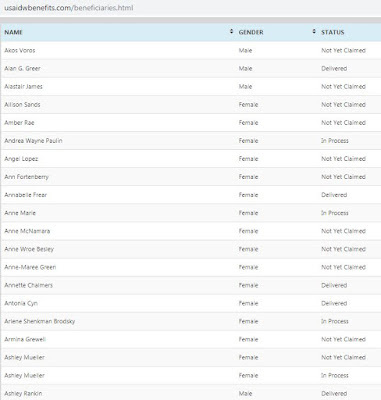 We believe this may indicate what country that particular form was targeting. For example, many of the victims were in South Africa, which does not identify their National ID number as a "Social Security Number." By not having that field, they may avoid raising suspicion. Our advice? Perhaps you shouldn't do that! 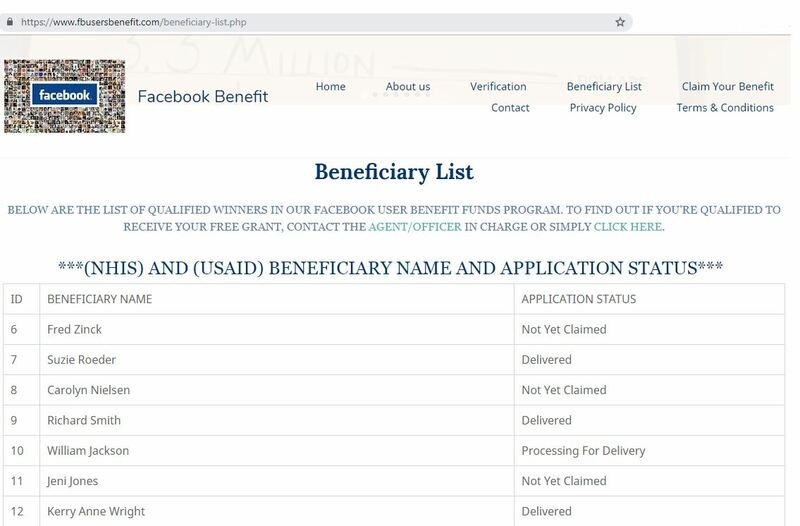 While Derek and I were exploring the sites and looking for additional ones, we realized that there is another version of the scam that imitates United States Federal Government Agencies. 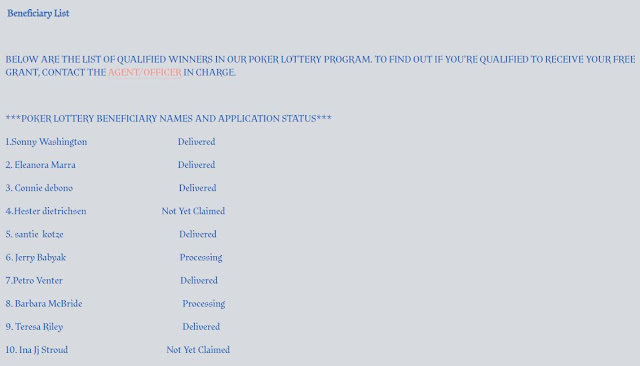 All of the above works in exactly the same way, however instead of being branded "Poker Lotto" the websites take on a more "Official" tone. 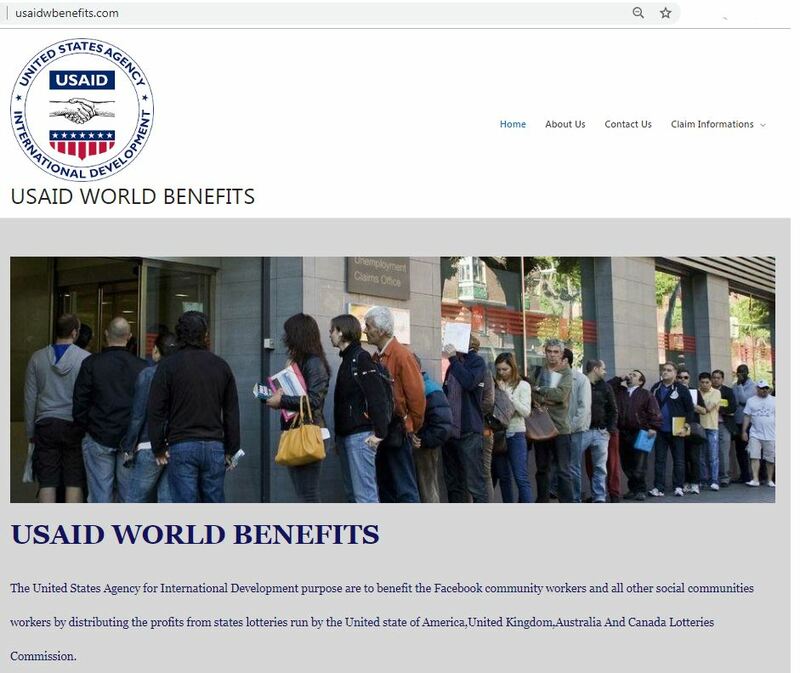 The USAIDWBENEFITS[. ]COM website is hosted in NameCheap's data center in Los Angeles on the IP address 199.188.200.93. Don't copy this! It is (C) 2019 the Workers Compensation Appeals Board and the Department of Health & Human Services! I'm not quite sure what the National Endowment for the Humanities has to do with this one . . . The address information left behind on this "Contact Us" form tells us a bit about how long these scams have been going on. When we searched on the address information with the phrase "Claim Your Grant" as part of the search, we found that the National Endowment for the Humanities put out a press release on June 21, 2016 warning people about exactly this type of scam! 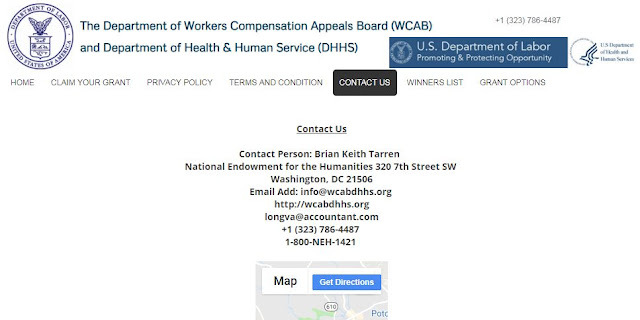 See: "Scam Impersonates NEH" on their website. 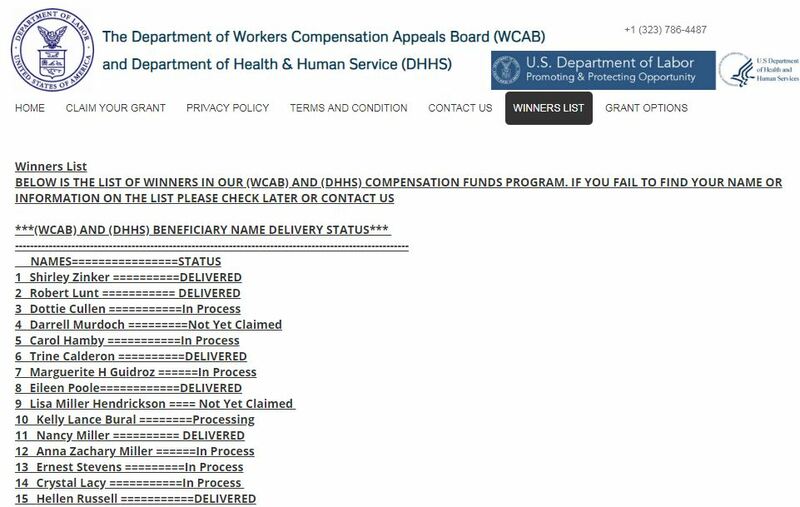 The Workers Compensation Board version of the scam is likely just as old, as one of their "AGENT" Facebook pages that are listed on these scam sites was created in 2015 and updated in 2016! 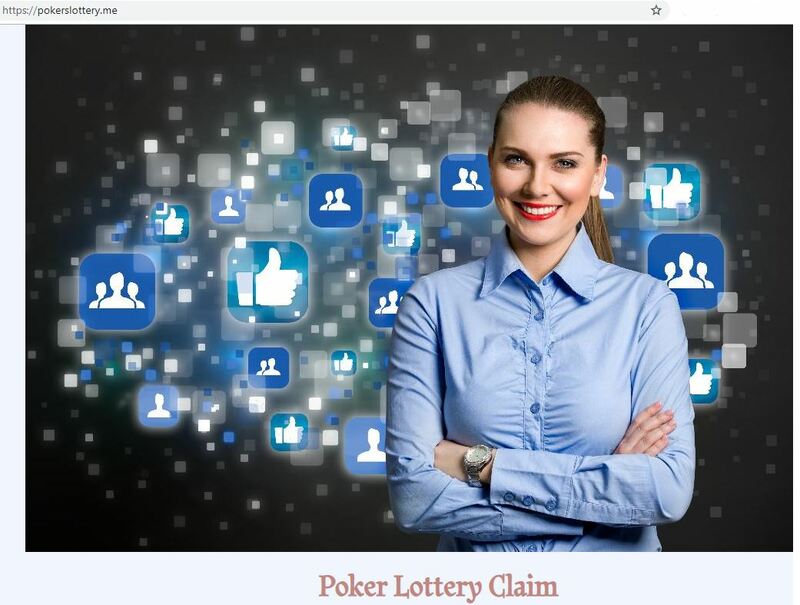 People may have been receiving notices of Lottery winnings from her account for a Very Long Time! Asuncio from the Worker's Compensation Board has the odd Facebook Handle "CLAIM IT ONLINE1"
The Facebook Benefit site also uses "A Sophisticated Automated Database to Randomly select E-mail Accounts And profile Page Owners that frequently surf the Facebook." 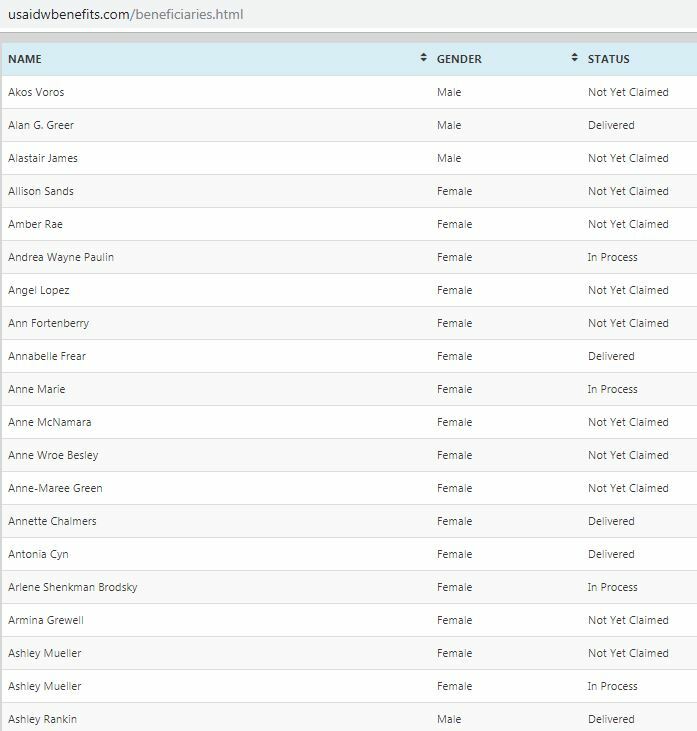 Feel free to leave me a comment below if you'd like to pass it to me, or if you are in the United States, please take a moment to share your details with the FBI's Internet Crime and Complaint Center, IC3.gov. 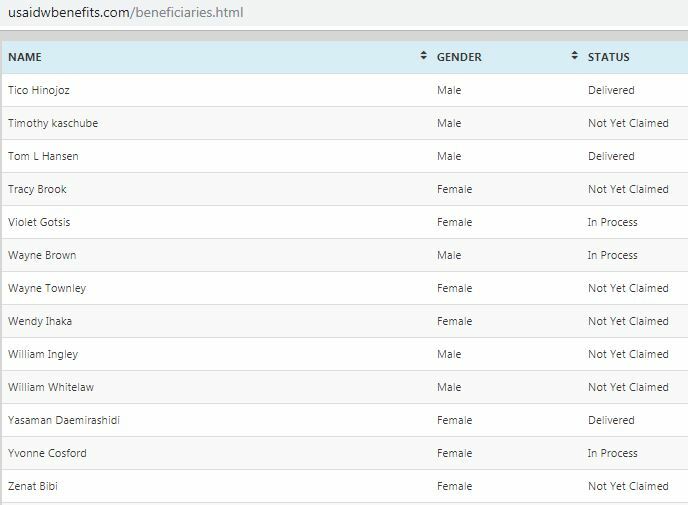 The great people at AA419 work closely with the website ScamSurvivors.com and would love to have you report details about anything you may have experienced related to this or other scams by visiting the Scam Survivors Forum.